Help your cats or dogs learn good house manners by keeping them off furniture or counters, or out of selected rooms. ScatMat emits a mild, harmless static pulse when your pet touches it. Pets soon learn which parts of your home they should avoid. 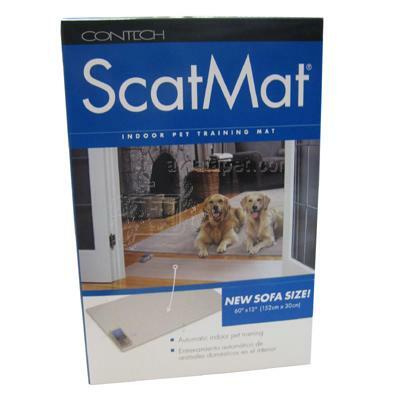 With three intensity levels, ScatMat works for any size cat or dog. Size is 60 x 12 inches. Requires a 9v alkaline battery, not included. Please note that the power pack on the Sofa Mate reads 9 Volt DC, but the 6-Volt adapter (sold separately) is an approved alternative to 9-Volt DC batteries and replaces 9 Volt DC Adapters.